What's in my camera bag (written by Jen). I am not a professional photographer, but I have gone through much trial and error (really bad photos) to determine what is the right mix of camera equipment to bring on a photographic wildlife safari. This post covers what's in my camera bag and Ian's camera bag. Ian's camera bag is almost a duplicate of my bag so that we are not left camera-less if one of the cameras or lenses break or if something is lost or stolen. I am a Nikon user, but the general advice below is the same regardless of the brand of camera that you want to use. Before I tell you what is in my camera bag, let's discuss what is not in my camera bag--my smart phone and tablet. I know, it's hard to part from these devices, but hear me out. First, poaching of animals, particularly elephants and rhinos, is a real problem. So, if you are taking real time photos and posting them on social media, you might be alerting potential poachers of animal locations. In fact, some safari lodges will ask you to not bring your phone with you on a safari drive for this reason. Second, if you are in a location where you have cell service (like South Africa), nobody wants to hear your cell phone buzzing or ringing while trying to watch a cheetah hunt a wildebeest calf. Seriously, it is just the worst. Third, you are on vacation. Fourth, they take crappy photos of moving animals. These devices simply don't have a fast enough shutter to catch a good photo of a moving animal. If you are just looking to take still photos of people and the landscape to share on social media then it probably doesn't matter that phones and tablets don't take high quality photos. But, if you want to use these photos in a book or in frames, you will be better served by using a real camera. The National Geographic Earth Explorer bag with the Nikon D80 and the Nikon AF-S DX NIKKOR 18-300mm f/3.5-5.6G ED VR Lens. The little nikon is good for bragging photos. This is proof that I spotted a porcupine and got on the score board at Mala Mala, South Africa. See www.malamala.com. The little point is shoot is good when others are taking photos of you. 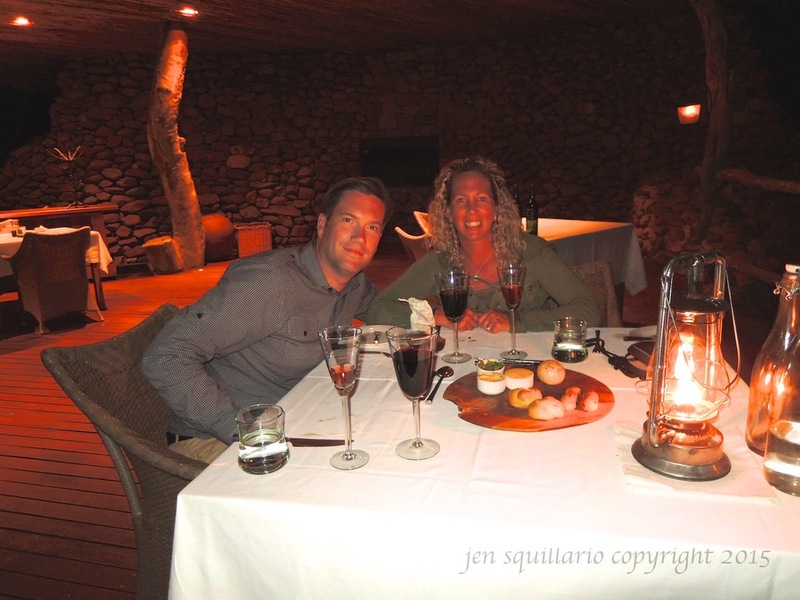 This is Ian and I having dinner at Tswalu in South Africa. See www.tswalu.com. 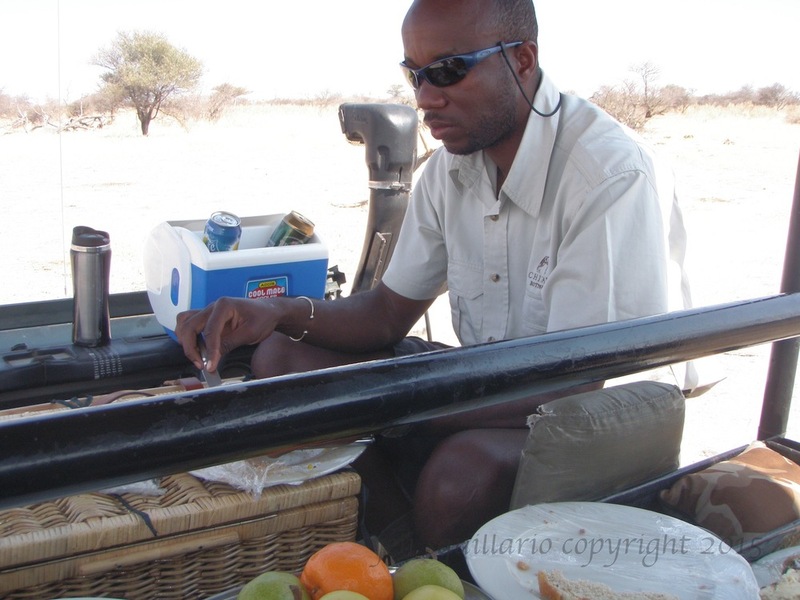 The little point and shoot is great for catching unique experiences, like eating breakfast on the safari vehicle while following cheetah. This was taken at Chitabe Camp in the Okavango Delta, www.wilderness-safaris.com. Another unique experience captured with the little point and shoot, surprise lunch with champagne while we wait for our plane at Abu Camp in Botswana, www.wilderness-safaris.com. If you want to go with a DSLR camera, but aren't ready to buy one, rent one. I've used www.lensrentals.com a number of times for camera and lens rental. If you are going to rent a camera, make certain that you get it a few days before leaving for your trip so that you can practice. If you are just starting with a DSLR camera, I suggest something like the Nikon D90. It is a great entry level DSLR. I started with its predecessor, the Nikon D80, but have used the Nikon D90. I still use the D80 today, which Ian usually carries. We put a lens on it that has a bit more flexibility than the telephoto lens on my camera. 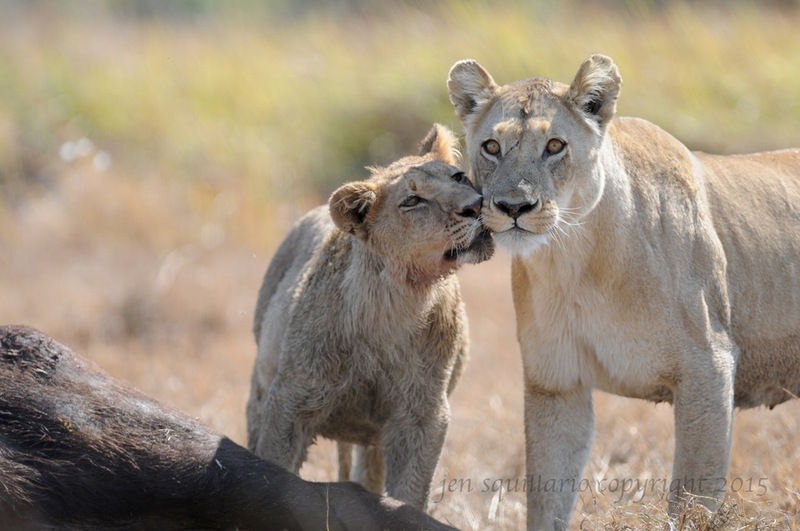 Ian and I use the D80 to shoot wildlife but also more of those atmospheric photos while out on safari. I use the Nikon D300s; this camera is not for beginners. It is a semi-professional camera. I recommend it to those who are already comfortable with DSLR cameras and are no longer using the automatic settings on the camera. Taken with the Nikon D80 with the Nikon AF Zoom-NIKKOR 70-300mm f/5 5.6. Taken at www.simbabiligamelodge.co.za. Taken with the Nikon D80 with Nikon AF Zoom-NIKKOR 70-300mm f/5 5.6. Taken at Simbavati in South Africa, www.simbavati.com. Taken with the Nikon D80 with the Nikon AF Zoom-NIKKOR 70-300mm f/5 5.6. Taken at Chitabe Camp in Botswana, see www.wilderness-safaris.com. Taken with the Nikon D300s with the Nikon AF-S DX NIKKOR 18-300mm f/3.5-5.6G ED VR Lens. Taken at Tswalu, South Africa, www.tswalu.com. Taken with the Nikon D80, with the Nikon AF-S DX NIKKOR 18-300mm f/3.5-5.6G ED VR Lens. Taken at Mala Mala, South Africa, www.malamala.com. Taken with the Nikon D80 with the Nikon AF-S DX NIKKOR 18-300mm f/3.5-5.6G ED VR Lens. Taken in Hwange National Park, Zimbabwe. This lens is great for taking photos of your friends and family while out on safari. The view of the Drakensburg mountains from a helicopter while on safari in the Kruger, South Africa. Taken with the Nikon D80 with the Nikon AF-S DX NIKKOR 18-300mm f/3.5-5.6G ED VR Lens. Taken with the Nikon D300s, with Nikon AF-S NIKKOR 80-400mm f/4.5-5.6 ED VR Lens. Taken at Kings Pool Camp in the Okavango Delta, Botswana, www.wilderness-safaris.com. Taken with the Nikon D300s, with the Nikon AF-S NIKKOR 80-400mm f/4.5-5.6 ED VR Lens. Taken at Mana Pools, Zimbabwe. Taken with the Nikon D300s, with Nikon AF-S NIKKOR 80-400mm f/4.5-5.6 ED VR Lens. Taken at Tubu Tree Camp, Okavango Delta, Botswana, www.wilderness-safaris.com. Taken with the Nikon D300s, with Nikon AF-S NIKKOR 80-400mm f/4.5-5.6 ED VR Lens. Taken at Hwange National Park, Zimbabwe. Taken with the Nikon D300s, with the Nikon AF-S NIKKOR 300mm f/2.8G ED VR II Lens. Taken at Chitabe Camp, Okavango Delta, Botswana, www.wilderness-safaris.com. Taken with Nikon D300s, with the Nikon AF-S NIKKOR 300mm f/2.8G ED VR II Lens. Taken at Mombo Camp, Okavango Delta, Botswana, www.wilderness-safaris.com. Taken with the Nikon D300s, with the Nikon AF-S NIKKOR 300mm f/2.8G ED VR II Lens. Taken in the Okavango Delta, Botswana. For a camera bag, particularly on a photographic safari in Africa, I recommend the National Geographic Earth Explorer (pictured above) (available at www.bhphotovideo.com). It's light and has plenty of room for your cameras, camera equipment, and even a laptop. Plus, it fits right in with the requisite safari colors. A GoPro. This is a new addition to my camera bag. Some kind of plastic bag or cover that I use to cover the camera and lens when it drizzles, the safari truck is submerged in high water, or it's really dusty. Two batteries and two chargers for each camera, one packed in my bag, the other in Ian's. An excessive amount of memory cards distributed between the two bags. I have too many of these, but I shoot in the raw, which takes up a lot of space. I never want to feel as if I have to hold back because I may run out of space on my memory cards. Two Ruggard Memory Cards cases (one for each bag) to contain those memory cards that are full of what promises to be amazing photos. Ziplock bags (You never know what you're going to need them for). Masking tape (It's good for taping things that break back together.). My camera and lens manuals (just in case). Two (one for each bag) lens cleaner "pens" (It has a brush and a spot remover). Cards with phone, email, etc. to hand to you new safari buddies. If it is all you have, a business card will do (but remember you are on vacation). **The banner photo for this blog of me taking a photo of buffalo was taken by Ian in a hide at a water hole at Little Makalolo, Hwange National Park, Zimbabwe, www.wilderness-safaris.com.